TGIF !!! Let the weekend begin and we hope there will be a bit of sunshine because the two old ladies of the Layla Neighborhood, Mom and Layla need some warming up. 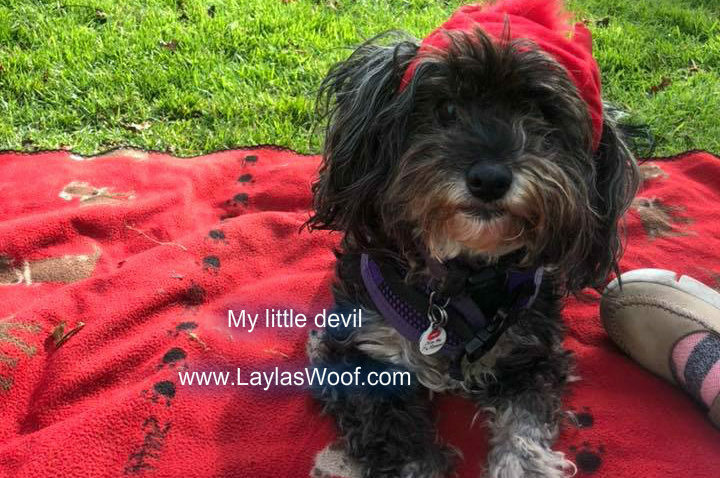 And now we are sure why we called this blog Old Lady Quirks, it is because we are getting older and with age comes the new quirks, and bless Layla the list is growing. My vet laughed when I told her and all she said that is the aging process and I must get used to it. So as I do giggle over some of them I though we all need laughter in our lives so lets share and make a blog of them. 01. She is afraid of the sound from the microwave and we live in a studio so now when I use it she hides in the bathroom, so there is a bed in the shower for her now. 02. She loves to sleep late in the mornings which is fine with me but once we are out she can walk the whole of San Francisco if she can, and will sit and be stubborn if she does not get her way. So we do a lot of zig zagging as she wants her way or it is no way, giving me a miserable look at the same time. 03. The dog park she is suddenly not comfortable going to as she does not like the clapping that some of the dog owners do although we are sitting away from them, this I am really working on as summer is around the corner. 04. In the evenings when I take her for her last walk at about 6 – 7, she loves walking around the supermarket parking lot, lots of smells LOL and we can do this like 6 times and then will walk past the entrance to go home, Madam trotting away all happy, me exhausted and hungry. 05. Thank goodness no food quirks phew as the above is keeping me busy as it it. As you can see with age comes quirks, and some quirks means adapting your life to the old Lady’s needs which is becoming interesting on a daily basis. 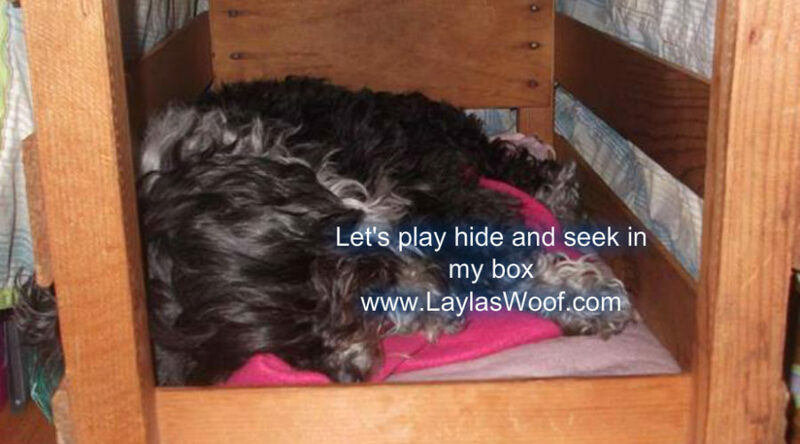 So on this quirky note, we hope everyone has a wonderful weekend, with a woof and love from Layla. Spring has arrived and the sun is shining although they say there is going to be more rain grrrrrrrrrrrrr. It has been awesome though being able to walk Layla her long walks in the mornings which she loves. 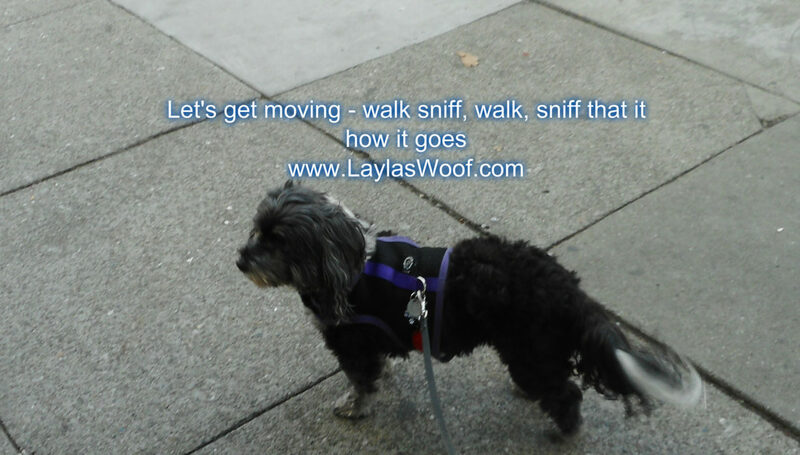 So as you always see Layla sitting or sleeping LOL I decided to share with you a video of her walking – or as I call it on a mission as once she gets started she just goes LOL and I feel we walk San Francisco. Last weekend we spent most of the time in the park, the weather was wonderfully warm and it was just great to sit on a blanket and relax with coffee of course, Madam and her treats and the best of all no electronics. I love those kind of days when I people / dog watch and do nothing. 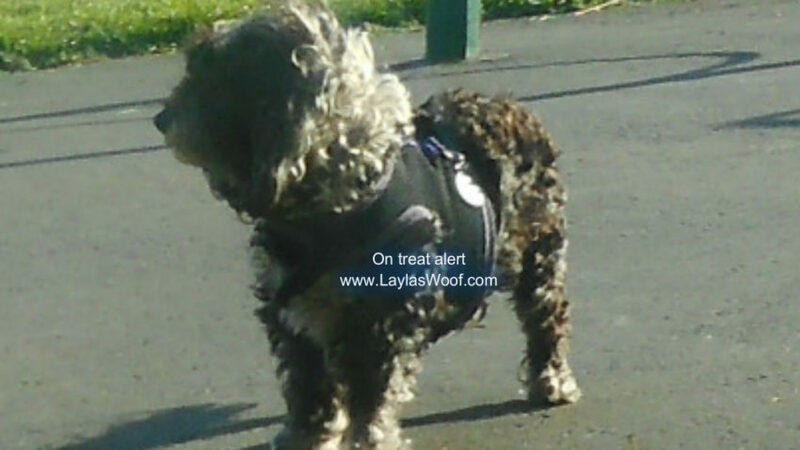 I have also found that since she is on her new supplements from Raw Paws Pet Food her energy level has doubled and it is great, she is also not itching when coming in from the park which I think is the best news of all and I hope it just carries on this way. On Tuesday she got a bath, or as she calls it punishment but her favorite of course is getting all the free treats at the Pet Store where the bathing is done. So she is smelling of coconut at the moment which is better than the smelly park smells from rolling in the grass. 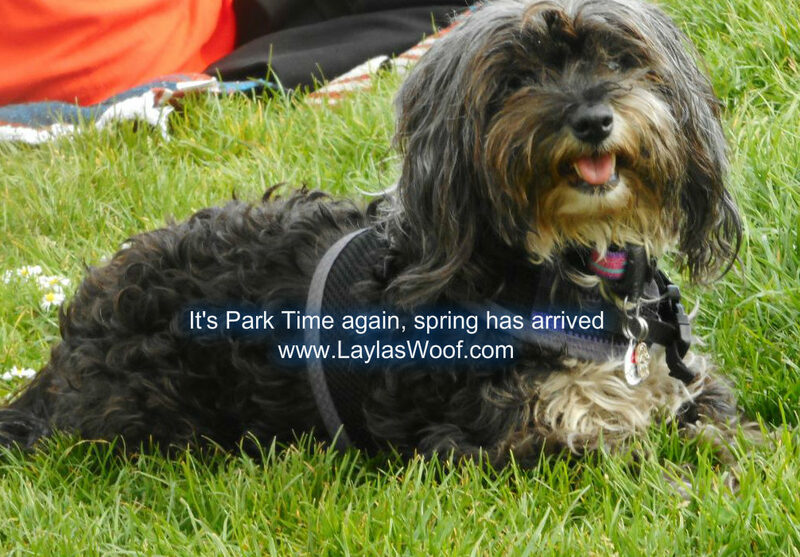 I am at the moment looking into what dog events are happening this year in the Bay Area which is my favorite also, Layla gets to taste all the treats and I get to check all out and of course carry her in her back pack. The first one I know is happening in April around the corner from us, one of my favorites. So that is what is happening in the Layla Neighborhood at the moment. One week into the New Year and it has not stopped raining since Saturday. I have been singing rain rain go away Layla needs to walk and play but it is not helping. Layla has never liked the rain and it stems from her having been an outside dog in her past life as I call it so it is a battle to get her out when it rains and if she sees her raincoat she goes and hides in her box and stays there. So the past week I decided to try a new approach with less stress and it seems to be working. In the mornings I let her sleep for as long as she wants and when she feels she needs to go out we go out, she tells me by getting up and walking towards the door. I am doing that also during the day or evening by letting her tell me and wow what a difference it has made. 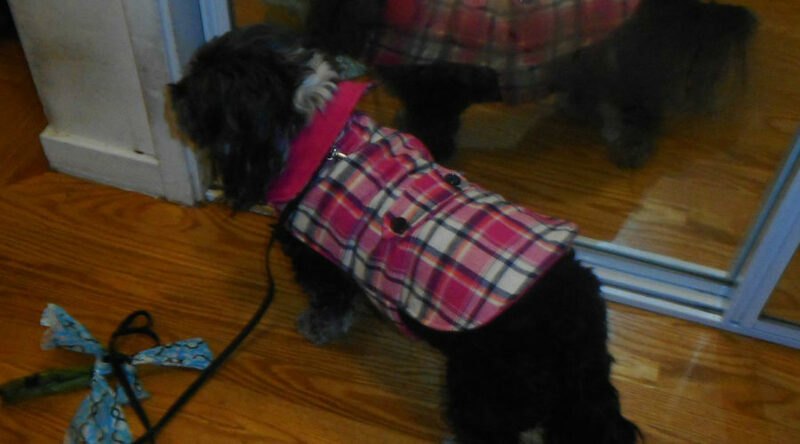 She is more relaxed, happier to go out and not fighting me with the raincoat. It might not be long walks like we are used to but at least she is going out to potty. I cannot believe that I never thought about this in the past but as I am saying to myself better late than never. 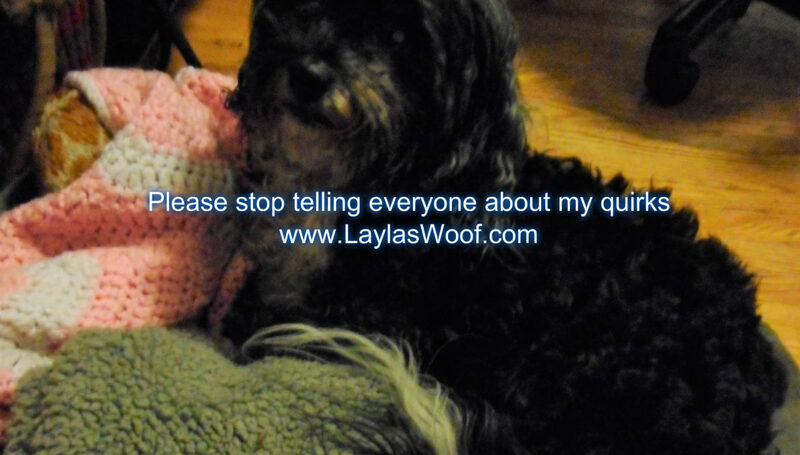 Layla will be 12 this year, like me she is aging and with it comes all the new quirks or triggers and am having to deal with them on a daily basis. She is also losing her sight in her left eye which does not make things easier. She does not like going out in the evenings when it is dark so her last walk is like 6 or 7. Her new fear is clapping and when we in the dog park if someone claps for their dog she dives under the bench to hide. I am not giving in to her by leaving but the opposite I pick her up and cuddle her to give her a feeling of security. There are days that it works and days that it does not. Treats always work though LOL. Our lives are changing because of it, I am working through her fears/triggers/quirks on a daily basis and learning at the same time. Thank goodness her appetite or water consumption has not changed which is keeping me more relaxed. I have also found an amazing chew for her, not as hard as bones but it keeps her really busy during the day in this weather. It is a turkey tendon and she loves them. My pet store has a great deal at the moment of buy 3 get one free so have stocked up on them to keep her happy. She is still doing zoomies when we enter the building, full of puppy energy and as I call her Ms. Piss and Vinegar, that she is. She even plays more with her squeaky toys lately which is awesome as I love watching her jump on the bed and grab one to squeak like crazy. I have started a new part time job which is taking me out of the house for about 4 to 5 hours each day and thank goodness I do not have to deal with anxiety as she seems to be handling this really well. So that is what is happening in the Layla Neighborhood at the moment, we are stuck indoors because of the rain, Jazz playing in the background so life is good here for us two old ladies. How are all of you coping with the cold weather and rain ? Woof November has arrived ! We cannot believe that the year is nearly over and 2019 is around the corner. It seems to be whizzing by. I decided to put a hat on Layla for Halloween LOL – she actually did not mind it. With all the tragedies all over the world this past week Layla and I decided to lie low and just spend as much time in the sunshine in the park and off all electronics. We both decided it was the healthiest way to be. Last week Layla had a really bad attack of allergies plus she was just drinking more than normal plus wanting to pee every two hours so on Friday I took her to the vet for a check up. The vet was great as always, checked her thoroughly and explained to me that with allergies dogs sometimes drink more than normal but I should monitor her. We discussed what to do with her allergies and as I hate medications especially Apoquel as I feel once the dose is over the scratching begins again so for me that is not a solution. So after a lot of discussions I decided not happily but I also aware something needs to be done he gave her the Cytopoint shot. All I can say is within 24 hours she had stopped scratching totally, slept through the night phew as I needed sleep also and as it lasts for about 4 – 6 weeks by the time it would wears off winter should be here. I had not heard of it in the past but after reading about it at home I am happy we did it. Layla, when she starts scratching, she starts hopping badly with her back leg in the air and I worry about her back, especially as she is 11 years old and I don’t want her to pull any muscles so that is another reason I went for it. Another thing that made me really happy was this vet (I go to a clinic where there are 4 and I know them all) believes in CBD oil for pets and we had an amazing chat about it. NOW the good news HA – Remember when I did the Embark DNA test on her – the results came in and I have not stopped laughing as I am trying to find the breeds in her. I love this company and am so happy I did the DNA test as I also found out she has no genetic diseases which is a big weight off my shoulders. What can I say to this : She is a Rescued Concoction full of love, happiness and personality. She is my PooPeCockLha ROFL. So that is what is happening in the Layla Neighborhood, never a dull moment but always full of wagging tails and smiles. We hope you had a fun Halloween and did not OD on treats and candy. Am off now for my afternoon siesta as it is hard work being a dog. October being Domestic Violence Month and a month that brings back so many sad memories for Mom we decided last weekend to enjoy life and freedom instead. It is not that we are ignoring the sad fact of the abuse of women, kids and pets but it has been a long journey for Mom and having that freedom and sunny weather Mom decided to take advantage of it. 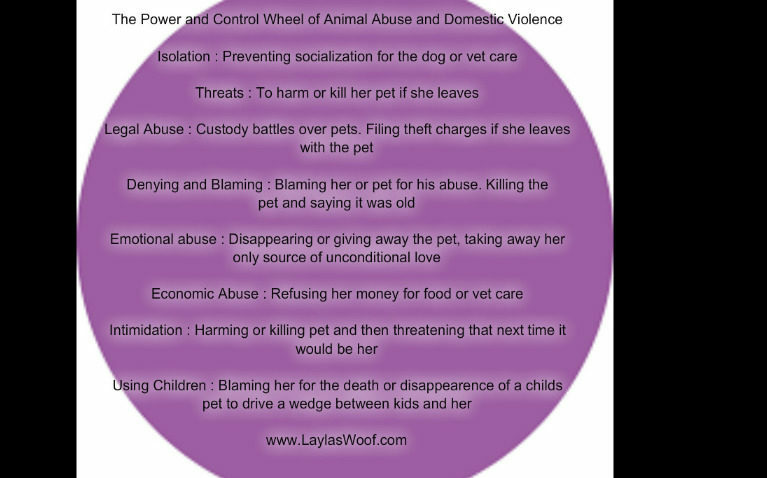 We are though going to include the Power and Control Wheel of Animal Abuse in Domestic Violence as this is an issue close to us and they do not have a voice but we do so we need to speak up. You are welcome to share this on your pages or websites and be there voices too, it would be much appreciated. Last weekend was a long weekend, so much to do all around San Francisco as there are always free events. Mom sat and worked out what we would do and the adventures started. BOL the only time I ever let her be boss is when making those decisions. It was also Fleet Week weekend and I do not like the jets flying over us plus Mom thinks that money should be used for better causes. 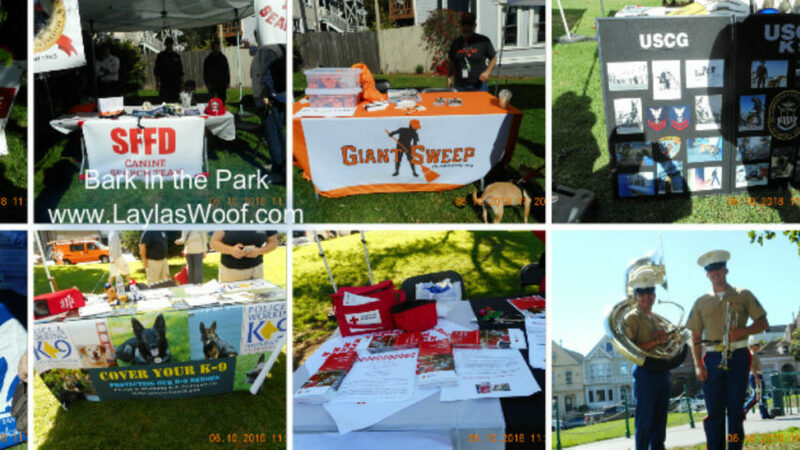 On Saturday they had in our Dog Park an event called Bark at the Park. This event honors our K-9 Heroes and their human friends during San Francisco Fleet Week. Lots of dogs, fun, and loads to learn on how to keep our pets safe during disasters. A really great noisy event, plus I love supporting these organizations that do so much for us. 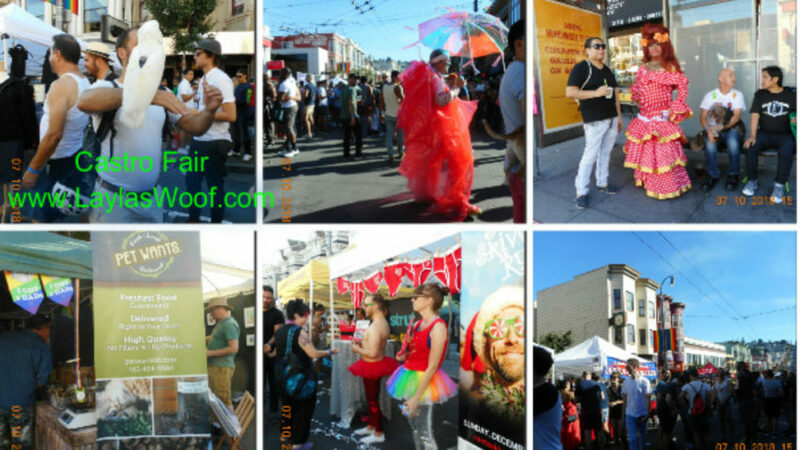 On Sunday was the annual Castro Street Fair – this is just a fun fair with lots of booths, food and dancing. We, of course went although I carried Madam in her backpack as it is chaotic the best was popping into one of the booths called Pet Wants, Layla woofs best treats in town and she got utterly spoiled. On the way home from the fair we stopped in the park, hung out with friends and just relaxed. The weather was perfect. On Monday I decided that was it, no events, no nothing and instead relaxed in the park with all our friends. It was just a relaxing day. So as you can see our life is always busy and I love it especially as I can take Layla with me although I must admit I do base a lot on Pet Events as they are fun and I really enjoy them. 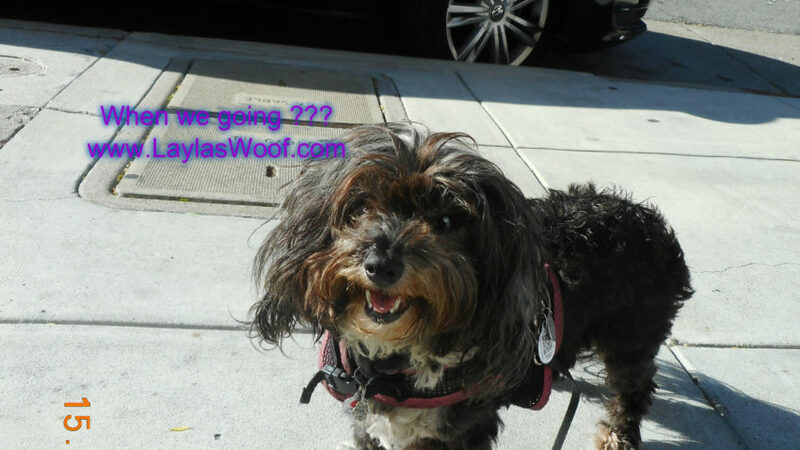 On this note we going to end our weekly adventure blog as Layla is waiting for dinner and I must make mine too. I have a big pot of veggie soup simmering also – yummmm. Have a wonderful weekend and everyone please be safe. TGIF ! Friday has arrived and with it of course the weekend. That is the best as it means adventures. Our last weekend was a busy one as always as I love to keep Mom busy, it is very important she does not become a couch potato BOL. Last Saturday we went to the Bay Area Pet Fair. This is an amazing two day event that is held once a year in the Bay Area. This event is held by a Californian Pet Store called Pet Food Express. What they do is hold an adoption event for all animals from Dogs, Cats, Birds, Rats, and others and if you adopt on one of those days you go home with an adoption Swag Bag. All the vendors that have their products in the stores have booths at the event with samples of their products so it is a wonderful way to see what is happening in the Pet Market. There were over 100 vendors so it is heaven for all of us. I went with a friend and of course Layla on Saturday. He has a rescued Dalmation and was curious to see what foods, treats, grooming products and the list can go on, was on the market and of course fill a bag with lots of samples. Layla was in heaven, she pigged out trying new samples and was one happy girl. I by the end was tired from having her on back in the backpack but on the other hand was just amazed as to what amazing products there are. BUT I think the highlight of this event was the amount of animals adopted, and they still do not have the final count which will be ready on Friday but the last I heard 1,526 animals went to their new homes. INCREDIBLE !!!!!!! 3. Personalized Care – If a dog tests “At Risk” for a condition they contact you personally to discuss this finding. This really interests me so cannot wait to get the results back plus it is so easy to do – all you need is a saliva sample and then LOL you give your dog a treat. 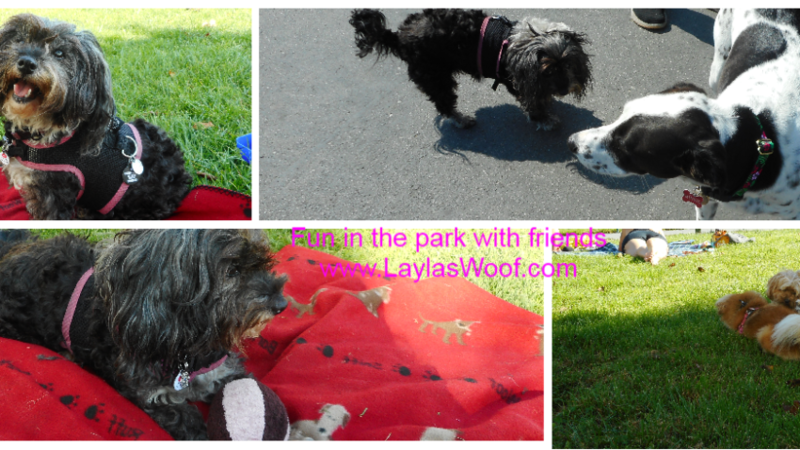 On Sunday we had a slowish day, relaxed and then went to our dog park to enjoy the weather and friends. What I had forgotten was the neighborhood was having a block party so we wandered over there for lunch which was great plus they had an amazing band playing. A wonderful way to mingle with friends, eat good food and listen to wonderful music. Madam of course was in her element as she got once again lots of snacks. 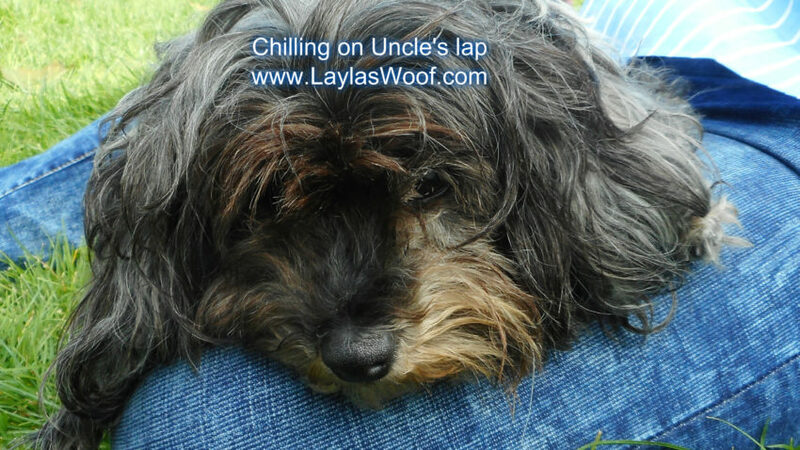 So as you can see I am not a couch potato and Layla she not call me that LOL as we have wonderful weekends out and about and relaxing with friends too. 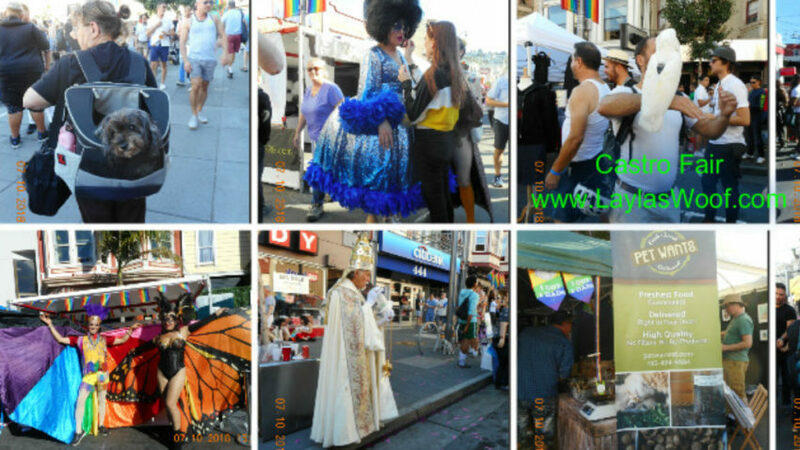 So now the weekend is arriving again, oy vey I have not decided what we going to do but for definite while the weather is still awesome in San Francisco we are going to be enjoying the outdoors. TGIF ! It is Friday, week is over and the weekend is starting. Lots happening in the Layla Neighborhood as always. Last weekend was a fun weekend. Mom did not volunteer but took some time for herself, what a concept and what we did was spend time in the park just relaxing. It was pawsome as I had lots of fun blanket hopping which is my favorite game and of course that way I get some extra pets for all the people. On Sunday Mom had a meeting to go to at the Shanti Project and she took me with her. What can I say but WOW petting heaven as there were like 20 people all sitting on the floor on pillows and I just wandered around from person to person to be loved up, now that is the life and wish it would happen more often. The best part was there was luncheon and I got some chicken, yummm. Sunday evening was the eve of our New Year so they were so sweet at the meeting and gave me a big doggy bag of all the food and veggies to bring home so I did not have to cook that evening which was awesome. Monday was New Years day, so we just relaxed in the park and Mom gave me some honey so that my New Year will be a sweet and happy one. 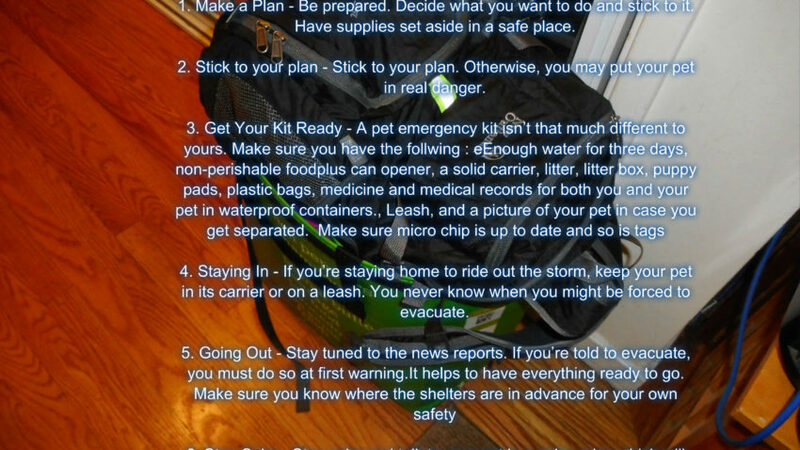 NOW we must not forget that September is Disaster Preparedness Month and with Hurricane Florence arriving we must make sure that we are all prepared, and that no pet must be left at home. I have read that shelters have opened for pets too so in a way there is no excuse anymore. These hurricanes are getting worse all the time, the world is changing and because of it it is getting scary so please be safe everyone. Meet-and-greet with 2,000+ adoptable dogs, cats, bunnies and small animals. Ready for a break? Enter your pooch in the Splash Dogs Dock Diving competition, check out a live band, or browse our 100+ vendor booths. Admission and parking are free. This is an event I love to go to every year and this year will be the first for Layla as in the past I have left her at home. Having the backpack makes it easier for me to take her. The fun part is all the vendors give freebies so you can go home with bags of goodies and I am on the look out for certain products so it will be great to get samples of what I want to try on Madam. She is going to be in treat heaven LOL. So that is what is happening in the Layla Neighborhood, always busy but lots of fun, and she is one special lucky rescue girl who has the life of a princess. Have a wonderful weekend everyone, and cannot wait to hear what you are all doing. It is the middle of the week and that means its my weekly woof, life is so hard having to keep up with this schedule so have asked for a pay raise in treats and my slave is debating about it. She can be so mean sometimes. We have had a quiet week here as the weather has been San Francisco weather, cold, gloomy and foggy so every opportunity that the sun comes out Mom grabs me and the park things and off we go. But chuckling, I have a new game and that is to hide in my box and refuse. It then becomes an argument but in the end Mom wins but this game is fun. Over the weekend Mom and I just relaxed, did not do any adventures and decided to take it easy and spend quality time together. It was awesome having her to myself although in the afternoons we would meet our friends in the park, freeze a bit in the sun and just chomp on treats, Mom her coffee and chat with friends. Let me introduce to two of my friends, Lucy who I love to play with and CJ who is very shy. He is a rescue and adorable and what is funny is now he knows Mom has treats in her bag he tries to get them out, sticking his long nose into the pockets. It is really funny to watch. Tomorrow, Thursday they are having a movie in the park which will be fun, it is Best in Show, so we going to bundle up and go watch it. There are going to be food trucks with all kinds of foods and the best part is all dogs are welcome. I have never been to a movie before so am really excited. Mom also told me that we are invited to a BBQ on Saturday evening, yumm where there is food I am happy although Mean Mom watches what I eat. So that is the happenings in our Neighborhood at the moment, never a dull moment but happy times which of course is the best. Mom is still on the famous mission BOL of research and phew in a way it is keeping her busy so she is not bothering me. We had a great weekend with lots of activities. On Saturday we spent the whole afternoon in the park as the weather has been awesome so I have had lots of park fun with my friends and of course lots of treats. On Sunday we went for an adventure to Japan town where they were having the annual Nihonmachi street fair. 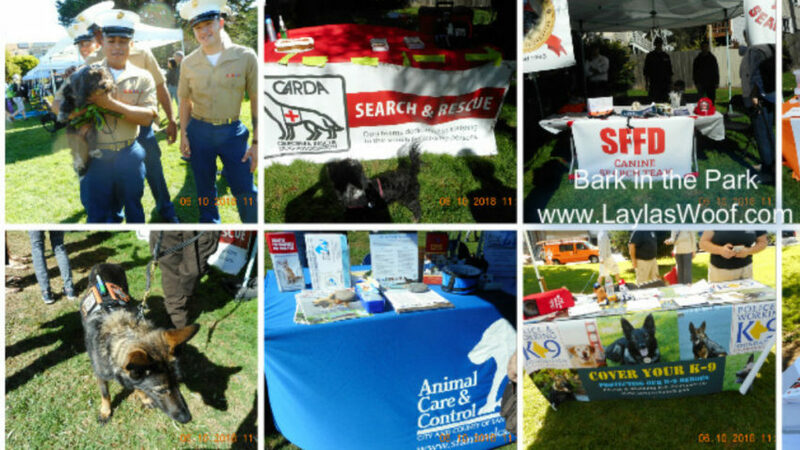 It is a great event that is held annually with dog events, local rescues of birds and dogs, and local vendors. It was an eye opener for me as I did not realize how many local businesses there are that make the food / treats here in San Francisco. Met up with some great people and in a future blog will be doing a review on one or two of them and their products. Layla of course had fun, sitting in her backpack which many people asked me about plus she filled up on treats, Miss Piggy. They also had a display of antique cars which was so great to see, lots of food of course for us humans and just a great family filled fun day. I love these small festivals and once again can say thank goodness for the backpack as it makes my life so much easier. We got home in the early afternoon, I needed coffee LOL, and then packed up and went to sit in the park to relax. The weather has been amazing and a lot of our friends came and sat with us, so it was fun chatting, dogs wandering around and of course mooching where possible and the type of afternoons I love. By the time we got home I was exhausted, so was Madam, she ate her dinner, I cooked something easy and then we both went to bed. Yesterday (Tuesday) I took Layla for her bi-annual check up, the vet is very happy with her health for her age, excluding her left eye where she is going blind slowly and we are just letting nature take it course, she is one happy healthy little girl. I discussed with the vet that I am changing her diet, she gave me a resource to check to make sure it is well balanced, so in a nutshell I, the Jewish Mom is relaxed. In the evening we went to our dog park where there was a community BBQ, the police get together to cook for us, it is a lot of fun plus we meet them in person, a wonderful community fun evening for all. So that has been our week, busy as always and as Mom says she is slowing down for the rest of the week kind of LOL, till the weekend arrives and more happenings. How has your week been ? August is the month we are celebrating our 3rd year of Layla blogging, I cannot believe it and it seems like yesterday that we wrote the first one, chuckling as I remember doing it, then deleting it by accident and having to re write the whole blog. I learnt a good lesson from that one. So what is happening here in the Layla Neighborhood is like this. Mom is on a mission and I think I am going into hiding. Yup that is what is happening here at the moment. 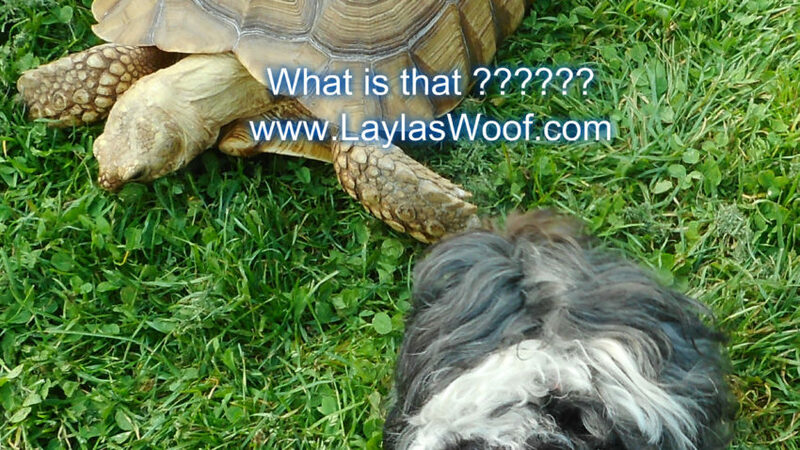 As you know I told you last week how I am slowly changing Layla’s diet so I have been doing a lot of research plus seeing what is happening in the city by visiting the different pet stores as I would love to be able to support the locals. Last week we went on adventure to Bernal Beasts, a great store, full of fantastic goodies of all kind. The reason we went there is Mom wanted to get some Goats Milk to try with me as she has read that it is really healthy. The people there are so warm and friendly and in a nutshell a great vibe. They also have a groomer but please do not give Mom any ideas as you know how much I hate them. We spent the weekend in the dog park when the sun came out as it has been really foggy and dreary in San Francisco. It was fun to hang out with our friends, eat lots of treats and just relax, chat and play. So as you can see never a dull moment here and as I say when Mom gets a bee in her bonnet oy vey it is time to really hibernate but on the other hand she is Jewish and making sure I stay really healthy. 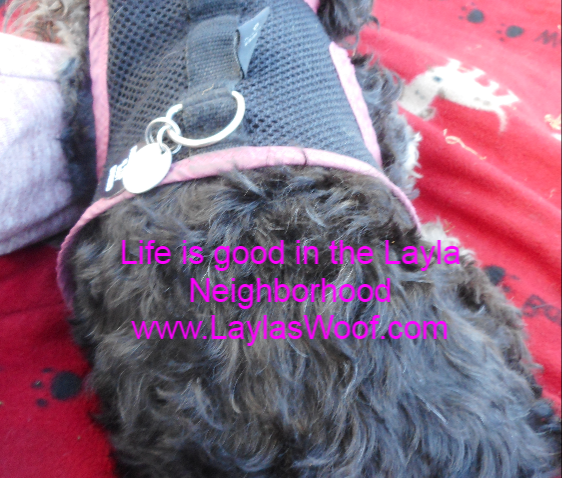 So that is what has been happening in the Layla Neighborhood, it is a happy one with lots of adventures, park time and of course cuddle and play time. National Pet First Aid Awareness Month. 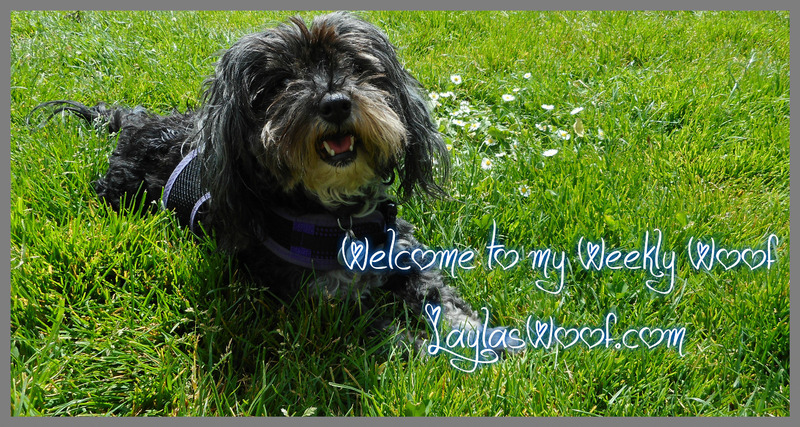 Copyright © 2019 Layla's Woof All Rights Reserved.